Goodyear Tires and Auto Repair is the premier Santa Cruz Ford service and repair shop. From brake repair on a Ford Fiesta, to Ford Focus electrical diagnostics, or maybe your venerable Taurus sprang an oil leak - our nationally ASE certified technicians have the skills, experience, and latest equipment to diagnose and repair your vehicle. 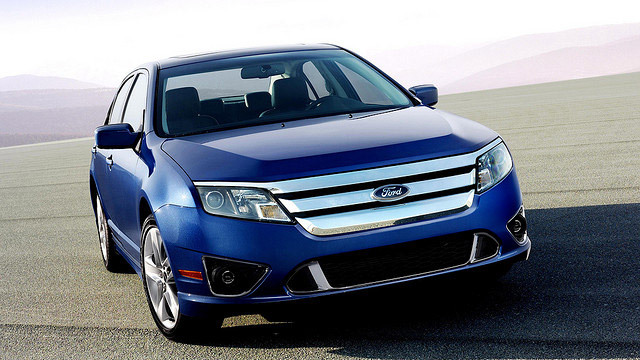 We provide both Ford maintenance service as well as repairs. Regular maintenance is crucial to extending your vehicle lifespan, and to maximize the dollars you spend on transportation. For your peace of mind, all repairs at Goodyear Tires and Auto Repair are backed by our 24 month/24,000 mile warranty. We provide a full gamut of automotive services and repairs - whether your Ford needs brake repair, a new battery, or air conditioning is blowing warm air, whether brake pads are worn, brake rotors need to be replaced, or your vehicle needs a new timing belt, transmission service, shocks, struts, serpentine belt, fuel pump replacement, or water pump replacement – we can get those diagnosed, fixed and get your vehicle back on the road, usually the same day. Automotive industry was changed by Henry Ford’s innovated assembly line. Today Ford company manufactures a wide range of vehicles – from pickup trucks, to hybrids, from compact cars to SUVs, in addition to its F-Series line of trucks and Ford Transit vans. At Goodyear Tires and Auto Repair, we are equipped and trained to service and repair all of them. Whether your car has the “check engine light” on, or its transmission makes funny noises, you can bring it to our repair shop and know your car will be treated as if it were our own. We suggest following manufacturer recommended maintenance schedule. Regular maintenance keeps your car in top shape, performing at its best, and keeps small problems from developing into serious repairs. Bringing your vehicle to us on regular basis gives us opportunity to spot impending trouble and fix it before it leads to breakdowns. So whether your Ford needs serious repairs, a routine service, or something just “doesn’t feel right” – we are ready to help – call today.